SCADA environments are a big interest for me. As responsible of the information security of an utility company, I need to ensure that risks inside those platforms are minimized in a way thay any control I place does not interfiere at all with the protocol and system function. That is why running things like metasploit or nexpose could be really dangerous if they are not well parameterized, as it could block the control to the RTU and IED and potentially cause a disaster if a system variable goes beyond control. There is an alternative to perform vulnerability asessments to SCADA devices less risky and with good result information. You can use nmap scripting engine to add vulnerability scanning functionality. The software can be downloaded from http://www.computec.ch/mruef/software/nmap_nse_vulscan-1.0.tar.gz. The csv files are vulnerability databases and you need to place them into a directory named vulscan in the same directory as all other .nse scripts. The vulscan.nse script needs to be with all the other nse scripts. Once installed into the nmap scripts directory, you are all set. Script selection: The script you want to use is vulscan.nse, so you should use --script=vulscan.nse. Script arguments: You can define which vulnerability database you want to use. The following databases are available: CVE (--script-args vulscandb=cve.csv), Security Tracker (--script-args vulscandb=securitytracker.csv), Security Focus (--script-args vulscandb=securityfocus.csv), Open Sourced Vulnerability Database (--script-args vulscandb=osvdb.csv) and Security Consulting Information Process Vulnerability Database (--script-args vulscandb=scipvuldb.csv). If you want to use all of them, don't use this argument to the script and leave only the script selection. 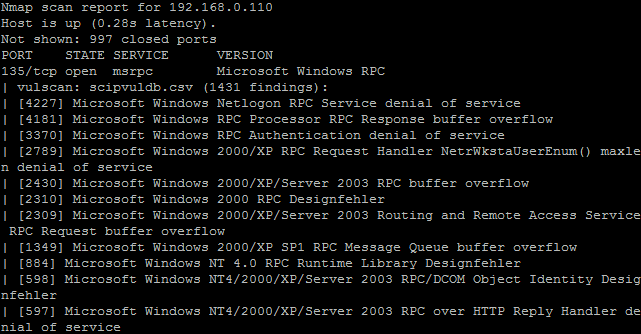 In future diaries I will show other nmap scripts I like to perform vulnerability asessment and pentest.